My Grandmother, Edith Sims, was a great cook and pie maker. I remember watching her roll out the crust and assemble the filling many times as a child. In fact, she made them so frequently that she could have one in the oven faster than you could drive to town and buy one. When visiting Grandpa and Grandma Sims, I looked forward to her meals which were always followed by some delicious dessert…many times one of her “scratch” pies. In fact, I always wanted a second piece but rarely got one because a 9 inch pie was only enough for one slice per person. When I got older, my mother showed me how to make them. Now, I often take the “cooks privilege” and have a second slice….with a cup of coffee at breakfast. But …..SSSHHHH…don’t tell anyone. LOL! In a sauce pan add the following ingredients. Using flat side of a large spoon, in a sweeping motion, press the dry ingredients against the side of the pan until all the lumps are gone and they are smooth. Continuously stir over medium heat until thick and bubbly. Remove from heat. With fork whip egg yolks together. To temper the egg mixture, gradually add 1 cup of custard into the egg yolks. Stir continually so the hot liquid does not cook the eggs. Then add the egg mixture back into the sauce pan and return to medium heat. Stir continually another 2 minutes. Pour into baked pie crust. 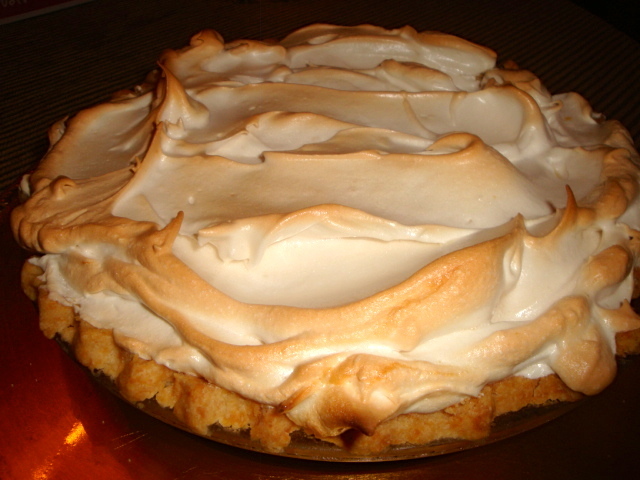 Then top with meringue. Make sure the egg whites are room temperature and pour into mixer then beat at high speed. With a large spatula, dollop the meringue on top of pie then gently work it to the edges, completely covering the pie. Bake at 350 degrees or until the meringue is lightly browned – about 10-12 minutes. (Tip for meringue) Make sure the egg whites are room temperature before whipping them – make sure there is not even a tiny bit of yolk in the egg white – do not over whip the egg whites. When they become stiff add the sugar and blend then stop whipping. Even though my Grandmother rolled out her pie crusts, I prefer this simpler recipe. I guess I can’t blame you. Chicken Soup IS good (and I was looking forward to reading the recipe); but, Chocolate Meringue Pie is soooooooooo muuuuuuuuuuuuch betterrrrrrrrr! I AM losing weight. Whether it’s enough to counteract the effects of both pies remains to be seen. Nonetheless, I look forward to the “experiment.” If it turns out well, I’ll let you know . . .